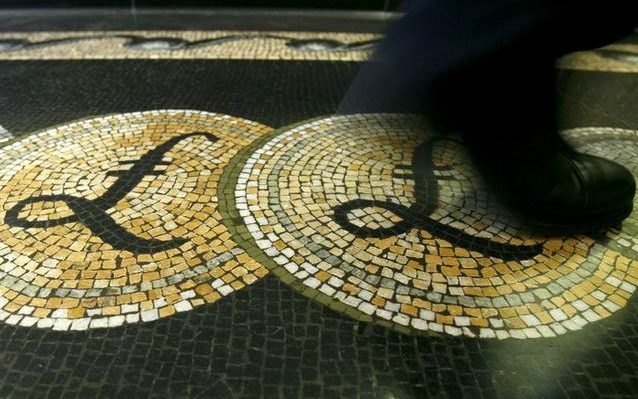 An employee is seen walking over a mosaic of pound sterling symbols set in the floor of the front hall of the Bank of England in London, Britain 25, 2008. Sterling rebounded slightly on Nov. 16, a day after falling nearly 2 percent against the dollar and the euro. It was trading at $1.2819 and 88.35 pence per euro at 1050 GMT on Nov. 16. The British currency fell on Nov. 15 after a series of resignations rocked Prime Minister Theresa May's government and threw her long-awaited Brexit agreement into doubt just hours after it was unveiled. The yield on 10-year UK government bonds fell more than 10 basis points to as low as 1.35 percent on Nov. 15. The yield was 1.403 percent at 1050 GMT on Nov. 16.